Kerstin Haase and J�rn Oleby are licensed dog physiotherapists and treat dogs with muscle, tendon, joint and cartilage related problems. They are also much appreciated lecturers and give courses in massage and stretching. J�rn Oleby is a qualified sports and health instructor for humans. Kerstin Haase is an experienced dog breeder and gives courses in obedience. For a competing dog full mobility is essential for the dog to perform at its best. As canine physiotherapist I treat dogs with muscle, tendon, joint and ligament related problems and injuries and have experienced how massage and stretching improves performance. Massage and stretching improve the quality of your dogs life. The dog may apart from running faster be able to enjoy the natural agility of youth for many more years of its life. Massage and stretching are no replacements for visits to the vet but they do help prevent injuries occurring. They are a complement to daily training and diet and are suitable for all dogs regardless of breed, age or size. The fundamental rule for massage and stretching is that they are suitable for healthy dogs. Should any physical problems arise you should not apply massage and stretching since this could make the problem worse. Always consult your vet if you are unsure. The main purpose of massage and stretching is to maintain and improve mobility, increase the blood circulation and have a relaxed and happy dog. If a dog has shortened musculature or muscle tensions, pressure accumulates across the joints and this impairs mobility. Regular massage and stretching help prevent strain injuries. Impaired mobility is a contributing factor in muscle related problems and can, in the long term, lead to a number of different types of injury. We should aim to achieve a balance in the musculature. Injury can be caused by training your dog too much with too little rest between training sessions. The muscles become tired and tense. Another dog might have poor stamina due to lack of exercise. The muscles atrophy, becoming smaller and weaker. A weak muscle is more easily tired and more easily injured. If your dog is already suffering from an injury you should be extremely careful. Since the muscles have limited elasticity and blood flow, there is a great danger that the injury will be aggravated. Secondary problems may also arise if you continue to train the dog. When a muscle ceases to function as it should, other muscles take over and try to compensate. This can result in excessive strain or imbalance and new injuries. Other causes of tension and stiffness might be psychological. The dog may have a tendency to become stressed in different situations. A nervous dog is tense and finds it difficult to relax. 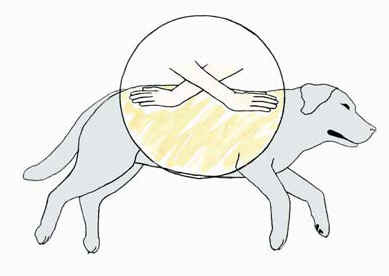 If you learn how to massage and stretch your dog you also learn about its body and musculature. You can compare how the muscles feel and are better able to identify tension and impaired mobility. You could compare your dogs performance to an athlete in a 100 or 800 metres race. For instance we know that a professional track and field athlete is training hard to perform competitively. As an owner of performing dogs we also train our dogs hard to perform well. When the competition starts and the dogs are away they reach a high speed in a few seconds. We want our dogs to be first crossing the finishing line. To achieve that, our dogs need to get into shape for a race or active season. The physical training is a specific, goal oriented approach used to achieve our goal. Performing dogs are trained in various ways using cycling, swimming or by running on sandy surfaces and in hilly terrain. For our dogs to perform the best they also need to stay healthy and to avoid injuries such as ruptures, chronic inflammations and stress fractures. Too much training when the dog has insufficient time to rest and recover can cause injuries. A performing dog, just as an athlete, is pressed hard and the muscles, tendons, joints or ligaments are liable to injuries. This all makes the preventive care so much more important. To perform well we need our dogs to stay healthy and their mobility to be good. When it comes to the professional athlete he or she has a team of physiotherapists, masseurs and doctors helping him or her to make the outmost performance. The same approach is also very common in horse racing probably because of the big earnings in keeping the horse healthy. You now have the opportunity to learn more about massage and stretching and to prepare your dogs better for racing. Massage is by far the best treatment for reducing muscle tension and the recovering period is reduced. You can progress faster with tougher training if you integrate massage and stretching because the muscles are assisted in the work of increasing the absorption of nutrients and the removal of lactic acid. Massage also extends the tissues and muscles we are unable to reach through stretching. Massage and stretching will give you a relaxed and better performing dog. Stretching is when you extend an extremity towards its ultimate position, in other words you separate the muscles root and insertion, holding this position for a moment. With stretching you work up good mobility in the muscle and around the joints and you also reduce the pressure on the joints. Hold the dogs elbow with one hand, grasping the wrist with the other. Move the leg forward and upwards, stretching the elbow joint and the flexor muscles of the foreleg (shoulder joint). How to use this knowledge in racing? First remember that the dog should have warmed up and exercised before starting the race. I also strongly recommend that you allow your dog to wind down after the race before any stretching activities. Here is a check list that could be used before the race. 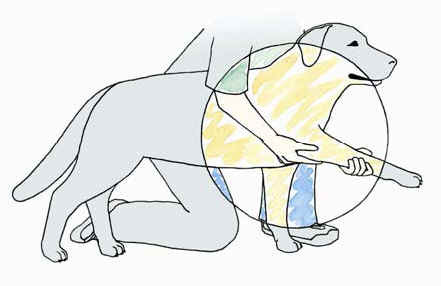  Let the dog walk slowly for a while and then increase the tempo for 2-3 minutes.  Let the dog trot for 2-3 minutes.  Let the dog gallop for one minute.  Then let the dog make some short explosive moves.  Let the dog wind down a little by going back to trotting and then walking. After the warm up you could also easily test your dogs mobility using the eight most common stretching grips. You should be sensitive to your dogs signals. The dog should not experience any discomfort. If it does, dont hesitate to contact the vet. After completing the race let the dog wind down and then carefully do some stretching exercises. And when you come home reward the dog with massage and you will get a happy racing dog ready for new challenges. Massage and stretching is an essential and low cost investment in your dogs health and future races. J�rn Oleby, author of the book Canine Massage and Stretching  A Dog Owners Manual"